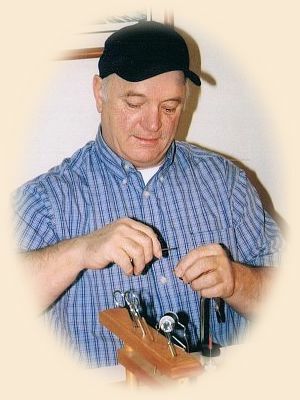 "Puffer - Fly Angler's Online Volumn 12 week 31"
It was another June day that started out the same as all the other days that week. The sun was just peeking over the green hills as they launched their boat on that beautiful Adirondack lake. While taking up the oars Mr. Nelson Cheney and his guide Frank repeated that same old conversation all fishermen have as they begin a new day of fishing. They spoke of things like the weather, flies, rods and reels, water conditions and the success and failures of other trips and how any of these things might affect the days fishing. During that conversation, a strategy for the day was planned and employed in hopes of netting a respectable number of trout. After a few hours of fishing with limited success, the guide was determined to put his client onto some fish, searched the lake for one last likely spot. 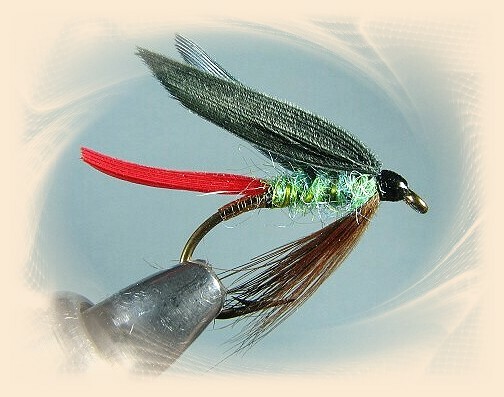 As the guide dropped anchor in a small cove, Mr. Cheney began to cast his trio of flies, two of which he had used that day without much success and for the first time today tie on a little blue fly which had no name that he was aware of. The following two hours was filled with the excitement and the exhilaration that only comes when trout rise and accept our offering with almost every cast. Standing in ankle deep water because Frank was to busy netting fish to bail, Mr. Cheney hooked trout after trout and later said that the little blue fly with no name made that June day stand out from other June days " like a Titan among pigmies". Later when it became torn, tattered and mutilated he put it away "as warriors gone to rest" gently wrapped in paper and the epitaph written "Thy work was well done; Thy rest earned". The little blue fly with no name we now know as the Puffer. Twenty-three years later, Mr. Cheney would relate this story to Mary Orvis Murbury with these words, "Puffer Pond, June, 1867-- Thirty-five pounds of trout in two hours. The last of the gentlemen that did that". I really liked this story from Mr. Cheney, because after reading more of his letter, I could not help but sit back in my chair and start to remember some enjoyable day on the water. A day I remember not so much because of the quantity of trout taken but the quality of the experience all made possible with the help of a little fly.